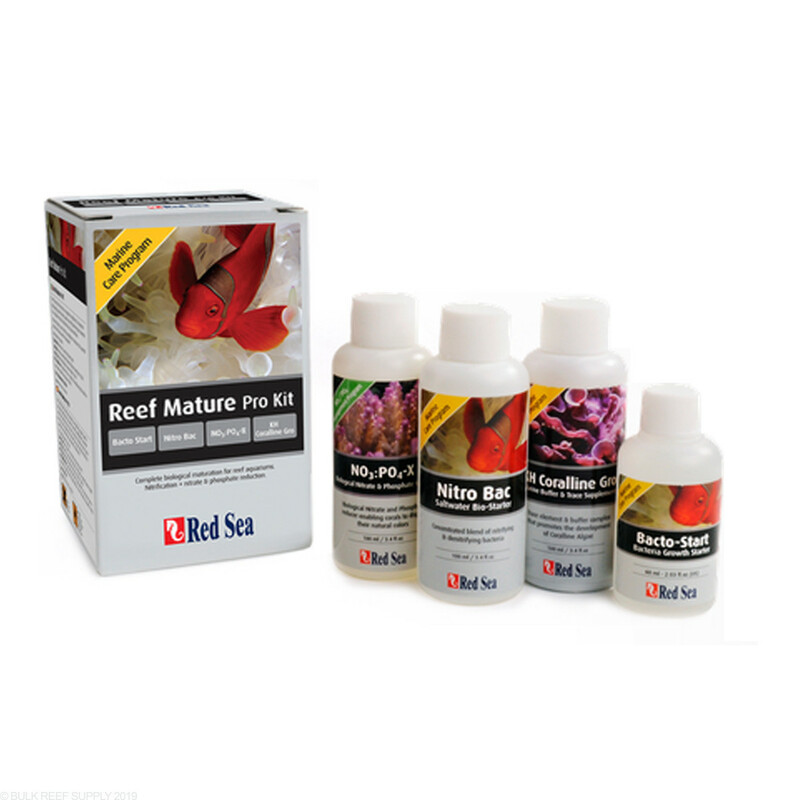 The Red Sea Reef Mature Pro Kit will help any tank with its biological filtration cycle. 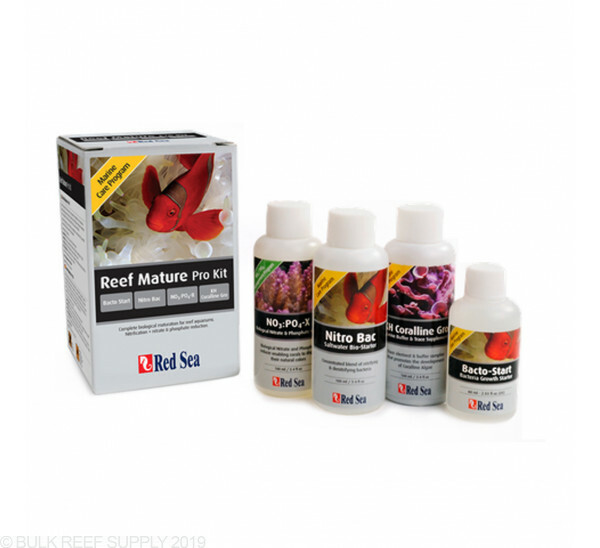 At Bulk Reef Supply we have used many different cycle starting products. The Reef Mature Pro kit is one of the few that just simply works well and is a very easy system to follow. A concentrated blend of nitrifying and de-nitrifying bacteria spores to help cycle the live rocks, substrate and the bio-media in a new tank. A unique complex of carbons and other organic bonded elements that are used by anoxic bacteria for the accurate control of algae nutrient (nitrate and phosphate) levels. A concentrated marine buffer complex, fortified with the specific minor and trace elements that promote the growth of coralline algae and other beneficial micro-fauna. A balanced blend of nitrogen and phosphorus components that simulate the natural waste products of an active aquarium, enabling a controlled development of the aerobic and anoxic bacteria. I bought this kit for a 112 gallon aquarium with dry base rock. Had to buy 2 kits to treat my aquarium but you can just buy extra nopox instead of 2 kits that's the only thing I ran out of. Get a test kit. It kinda worked for me but i did not use live rock so did not get the results the instructions said i would. I just got through the 21 days and continued to use nopox then added cleanup crew 1 week later 2 clowns. Everything seems to be perfect now on week 5. But still have not introduced corals yet probably 2 more weeks. Each kit is good for upto 65g of water.,so you may need more than one kit..follow directions..you will cycle faster..very good product,as with All of redsea stuff. I bought this not really sure if it would help or not. All my friends said the tank will cycle in 4 to 6 weeks and you don't need this. I bought the product anyway and was pleasantly surprised with it. My tank is a 45 gallon redsea but I used the directions and dosed my tank like it was a 25 gallon tank. Within 17 days my tank was cycled and ready to go. The directions give you a range of 'your tanks ammonia should be around this mark at this date but it might be more or less'. My tank was off those marks but at days 17 I was reading 0 ammonia, 0 nitrites and 20 nitrates. The directions were very easy to follow and dosing was simple. You do need some sort of test kit to test the water to see where you are but other than that this was simple and easy. I waited the full 21 days before I put some fish in there but was confident that when I did put them in there they would be fine.....and they are. Buy this stuff. It really works. I cycled 120 gal display tank, 120 lbs of dry rock as well as some live sand and was ammonia and nitrite free in 10 days. So far, the system is holding up great and I couldn't be happier. It takes a little bit of work, but it's worth it. This does great, works perfect def speeds up the process. I'm sure all of us at one time bought some inexpensive damsels to either get our tank's biological cycle going OR to test to make sure the fish don't go "belly up" by morning before adding the livestock you really want. Why sacrifice livestock when you can use this product to get your tank's biological system up and running. Once you use this product, I guarantee you will ALWAYS use it when establishing your next new reef tank. How many would I need for a Innovative Marine 40 gal cube. You will need 1 kit which works up to 65 gallons. Feel free to let us know if you have any further questions! When during the cycle do you add the macro algae to the refugium? I didn't see anything in the literature about this. Thanks. This product doesn't specifically address use with a refugium. I would bear in mind that if you are planning to use the NO3PO4-x that this will be in direct competition for the nutrients that macroalgae would use. I wouldn't usually plan to add macroalgae until you have fish or other tank inhabitants that will produce nutrients for the algae to uptake. While there shouldn't be any real harm in using both products, there may be some interactions between certain elements of the mature pro kit and the biopellet reactor approach. The Reef Mature has a liquid carbon source to encourage facultative bacteria, much the same as the biopellets. I would choose your carbon food source for the bacteria and stick to one and not do both. Aside from this, establishing nitrifying bacteria to break down ammonia and nitrite into nitrate as a part of the natural cycle should have no negative interaction with the function of the biopellet reactor and the biopellets will grow only as much bacteria as your system can support given nutrient levels.